This thirty year old pharmaceutical technician presented to Accident and Emergency with a sudden onset of visual blurring in his right eye. On examination his visual acuity was 6/12 OD and 6/6 OS, his right pupil was fixed and dilated (fig.1) and his the left pupil reacted normally. All other cranial nerves were normal as was his systemic examination and peripheral nervous system. He had no past medical history or past drug history. 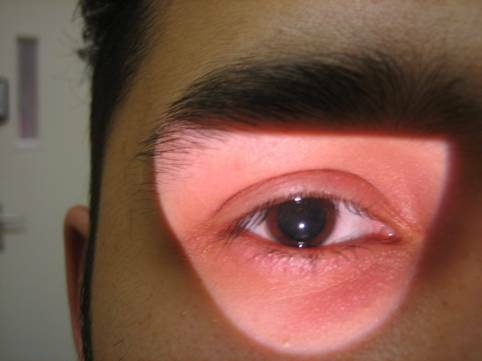 The patient was referred to Ophthalmology who examined him in the emergency department. Examination showed no relative afferent pupil defect indicating that the right afferent pupil pathway was intact and localised the lesion to the right efferent pupil pathway. The differential diagnosis was therefore Adie's tonic pupil, a third nerve palsy or pharmacological mydriasis. Failure of the pupil to constrict to a diluted preparation of topical pilocarpine 0.125% excluded the denervation hypersensitivity seen in Adie's pupil, this was made in the department by mixing one drop of pilocarpine 1% with seven drops of saline. Failure of the pupil to constrict to topical 1% pilocarpine in the absence of other cranial nerve pathology made a third nerve palsy unlikely. Revision of the history revealed that morning he had handled hyoscine butylbromide powder, a known antimuscarinic, accidental exposure of his eye to this would explain his clinical presentation. Therefore a diagnosis of accidental pharmaceutical mydriasis was made and the reduced visual acuity could be explained by his paralysed accommodation and the optical aberrations normally seen in a dilated pupil. 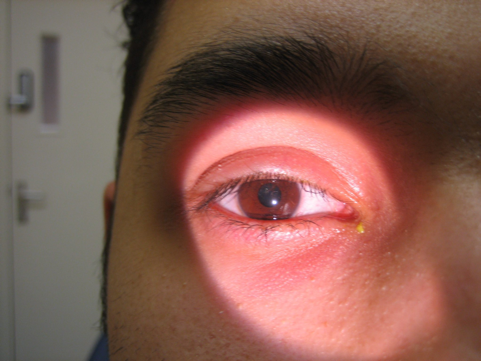 The patient was reviewed one week later when his right pupil had returned to normal (fig. 2).